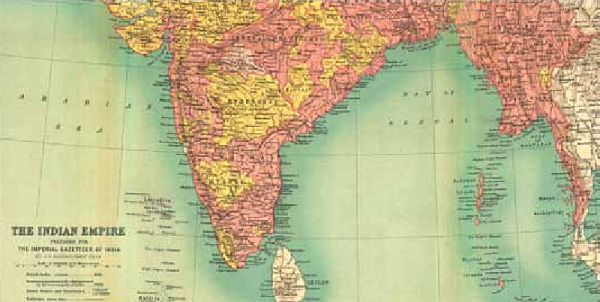 Map from The Indian Empire by J.G. Bartholomew (Oxford: Clarendon Press, 1907–09). From the Digital South Asia Library. On December 5–6, 2012, more than 50 participants attended a conference at Duke University to explore the connections between global scholarship and the collective ability of research libraries to support it. Supported by a grant from The Andrew W. Mellon Foundation and cosponsored by Duke and the Center for Research Libraries, the forum,Global Dimensions of Scholarship and Research Libraries: a Forum on the Future, drew together an array of faculty, librarians, university administrators, association and scholarly society leaders, and project managers from academically oriented institutions and organizations. The forum sought to inject an international focus into the current conversations regarding the future of research libraries in the digital age. Given the expanding emphasis on “globalization” on our campuses, and the technological developments that encourage more robust international collaboration, the forum highlighted the challenges and opportunities of access to information produced beyond the U.S. in support of scholarship. The intended outcome of the forum was to produce a proposal for change and a blueprint for international collection development equal to the needs of global humanities and social science research, acknowledging both traditional and emerging research agendas. This article summarizes the proceedings and papers presented at the forum, highlighting some of the discussion points and comments made by participants. A more formal report and the intended “blueprint” will be made available in March 2013. Leadoff presentations set the context for the academic evolution and funding history of international and area studies in U.S. institutions. Gibert W. Merkx, Professor of the Practice of Sociology and Director of International and Area Studies at Duke University, described the history and development of Area, International, and Foreign Language (AIFL) studies in the U.S. Merkx noted that in the decentralized system of higher education in the U.S., government support for foreign language and cultural expertise tends to rise and fall along with U.S. engagement with other countries, most often during wars and national security crises. The political-historical conditions after World War II that led to the support of the U.S. Title VI interdisciplinary centers were deeply rooted in U.S. interests in defense, intelligence, and (later) foreign assistance. This created a unique model for university-government collaboration unmatched anywhere else in the world. However, perennial tensions between official policy and area experts, as well as shifting government priorities, have resulted in fluctuating support for Title VI over the decades. It is partly in this context that the present crisis in funding for Title VI—and AIFL more broadly—can be understood. Merkx envisioned a potentially bright future for AIFL studies in the rapid globalization of universities and in the increasing demand for an international curriculum to support global competencies for undergraduates and graduate students alike. Seteney Shami, Program Director for Middle East, North Africa, and Inter-Asia at the Social Science Research Council (SSRC), presented some preliminary findings from the ongoing SSRC research project “Producing Knowledge on World Regions,” an effort to survey the condition of area studies and map how knowledge production at universities is changing in the face of globalization. In particular, the study examines the role that Title VI centers play in supporting international studies, and how funding priorities may change the shape of knowledge production. Despite these qualities, area studies centers remain sensitive to the shifts in funding, institutional priorities, and trends in academic research. Funding imperatives have often driven the shape of campus structures. Title VI programs are perceived by some as being narrowly focused and unrelated to the growing academic interest in international studies within the professional schools. As a result, the traditional approach to area studies has become “unmoored” in the global agendas of U.S. research universities. In the words of one interviewee of the SSRC study, international studies might be seen as a “kaleidoscope”: administrators don’t know what shape it will take when it stops turning. Charles Kurzman, Professor of Sociology at the University of North Carolina at Chapel Hill, reinforced the two presentations by Merkx and Shami by outlining the motivations behind the establishment of national centers for international and area studies to address the perceived imbalances in educational programs in the U.S. Kurzman sought to measure the extent to which American universities have responded to the call for investment in foreign studies over the past half-century by comparing the level of investment in scholarly resources to scholarly output in international studies over time. Kurzman presented two sets of data to measure these shifts. The first, representing knowledge sources, charted the number of international publications acquired by academic libraries from 1960 to 2007. Utilizing data provided by OCLC on the number of unique monographs held by at least one academic library, Kurzman sought to measure the extent of material collected from different regions of the world. The records show a relatively consistent percentage of acquisitions being U.S.-published books (around 40 percent of all records in WorldCat, from year to year). While the total numbers of non-U.S. books collected per year has grown over time in absolute terms, the ratio of international to domestic publications has remained reasonably steady. The second set of data, representing scholarly output, was derived from coding articles from six major social science journals to determine what region(s) of the world each article covered. 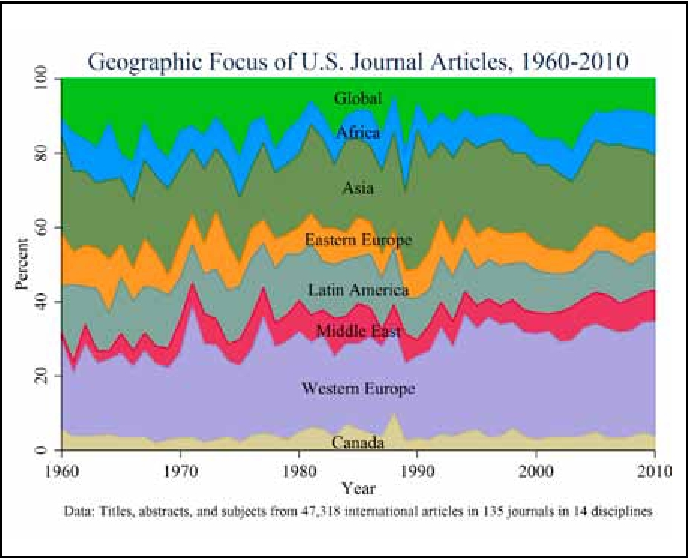 In his published paper, Kurzman notes that “of the articles whose regions could be identified, the proportion focusing on the United States shrank only slightly over the past half century, from almost 60 percent in the 1960s to just over 50 percent in the 2000s.” The diversity of world regions studied seems to have increased over time: historically, about one-quarter of the non-U.S.- focused articles covered Western Europe, shrinking to about one-fifth in recent years. The number of articles devoted to cross-regional or “world” studies has recently increased, and the data suggests periodic growth of interest in specific world regions during times of crises or U.S. intervention. However, here again, the data suggests that while American academics have paid more attention to international matters in absolute terms, the ratio of international to domestic scholarship has not increased significantly. As academic institutions have undergone profound shifts in recent years, so too have libraries and the provision of research resources. Having examined the academic perspective, presenters from academic libraries focused on the challenges of ensuring access to materials published abroad. Bernard Reilly, President of the Center for Research Libraries, provided an overview of the fundamental shifts over the past two decades in the production, distribution, and use of source materials for research and international studies. The radical change in the “supply chain” wrought by new technologies and new types of information must be understood in order for libraries to begin to formulate new responses. Sources: The production and distribution of scholarly resources and primary source material has significantly changed since the 1990s. Scholarly publishers, governments, and intergovernmental organizations, news media, and other producers increasingly publish directly to the Web, and aggregators play a newly prominent role in the distribution of materials. Suppliers: Organizations that have traditionally dealt with academic and research libraries in the provision of global scholarly information have in many cases consolidated, focusing on high-return investments (at the risk of making library collections more homogenous). Providers have moved increasingly toward databases and data sets. While the provision of print material is not likely to disappear in the near future, the allure of electronic provision of information is changing the equation of library ownership and long-term management of collections. Libraries: Over the decades, libraries have built and maintained extensive collections of materials for international studies for use by academic researchers. Numerous structures (both stand-alone as well as cooperative) were implemented to ensure the responsible collection and provision of information. Today, while overall library spending has increased, between 1992 and 2009 the percentage of total university spending devoted to libraries decreased by 28 percent. Many of the collecting structures devised decades ago remain, but have insufficiently adapted to the shifts in production and supply described above. Scholars: The end point of the supply chain, scholars have traditionally relied heavily upon libraries to provide information in physical form for teaching and research. Today, scholars seek information in electronic form, increasingly acquiring and/or generating their own data and utilizing sophisticated systems—usually not provided by the library—to collect and analyze information. Even as the professional schools and business sector increasingly use international information, much is acquired outside the traditional library supply chain, and often does not find its way to the library after research is conducted. Dan Hazen, Associate Librarian of Harvard College for Collection Development at Harvard University, posed a number of questions and outlined some of the assumptions, assertions, and unknowns affecting library priorities and activities. Area studies agenda: The diversity of area studies research—from “disinterested” theoretical scholarship to practically or ideologically driven inquiry—may have the unintended effect of polarizing and marginalizing support and funding for library collecting. What overarching agenda for area studies—if any consensus can be found—would facilitate effective library support for area and international studies? How do we measure success? Changes in the production and consumption of information: How can libraries and the academic community identify and respond to new developments in the production and dissemination of information as they occur? Can divergent information needs in the area and international studies realm be sufficiently understood to resolve into coherent policies for research libraries’ collections and content? How can we exploit the data we have on collections and use to understand unmet needs? Library sustainability and area studies support: Libraries have largely conceded that comprehensive collections at the institution level are no longer possible. Does cooperative collection development yet measure up to the hope that interdependence on others will provide scholars resources when required? We have not yet articulated a general strategy for collections cooperation, or created models to identify best practices and optimize performance. Collection discovery and tools: Librarians have been slow to exploit the possibilities of digital technologies to combine content and apply tools to the resulting aggregations. The focus on traditional library tools for information discovery all but ignores the fact that scholars rely on these tools less and less. How can we more effectively combine holdings and discovery tools that cut across collections and institutions to best accommodate the diversity of the international studies community? Basic Democracies Manual No. 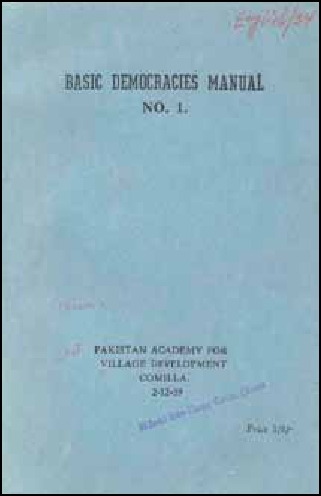 1 by the Pakistan Academy for Village Development, 1959. From CRL Collections, acquired through the Library of Congress PL-480 program. With a better understanding—if not consensus—on the dynamics and major challenges facing academic institutions and libraries today, participants on the second day of the forum presented case studies that demonstrated the potential for institutions to collaborate. James Nye, Bibliographer for Southern Asia at the University of Chicago, and Director, Digital South Asia Library (DSAL), focused his keynote presentation on global collaborations with peer institutions in the United Kingdom, Germany, France, and Japan, as well as with colleagues in developing world areas. Nye highlighted some of the features of collaborations that represented more advanced thinking about the nature of what a true “global” partnership entails. The University of Chicago, for instance, has acquired and developed collections in India and Pakistan that are designed to remain in country, rather than be taken to the U.S. (a principle Nye referred to as “catch and release” collection development). These collections serve both an international clientele as well as local users. Similarly but on a larger scale, the British Library’s Endangered Archives Programme (supported by the Arcadia Foundation) funds preservation and access to imperiled collections worldwide, while not mandating that these collections be moved from their locations. These models present great opportunity for equitable collaboration with partners abroad. But they present ongoing challenges of sustainability, both in terms of direct financial support as well as institutional commitment. While the largest contributions toward the development of library and archival resources for global and international studies come from universities themselves, the cutbacks in area studies funding for libraries through Title VI (especially the loss of TICFIA funding) have dealt a serious blow to foreign information access. Libraries need to devise new means of supporting the next generation of library programs. How can we think trans-regionally about what a global library should be? Charles Hale, Director of the Teresa Lozano Long Institute of Latin American Studies and Benson Latin American Collection, University of Texas at Austin, presented a “perspective from the field” relating to Texas’ work with archival collections abroad as part of its Human Rights Documentation Initiative (HRDI), started in 2008. Drawing from its experience with the Guatemalan National Police Historical Archive (AHPN), Texas developed a model of “noncustodial archiving,” in which the supporting institution does not take back collections with which it is dealing, but rather provides management oversight for the records that remain in the custody of the record creators. The process is a convergence of social engagement, scholarship, and archival functions. Ultimately the project organizers in Guatemala decided to send a copy of the digitized archive to Texas for hosting on the Web, to provide a separate, independent instance of the materials. Digital librarians began working on the next generation of discovery techniques, with a simultaneous effort toward integration with the curriculum. The University of Texas at Austin has acquired a digital copy of the Archivo Histórico de la Policía Nacional, which contains millions of documents, dating from 1882 to 1996, that chronicle the activities of Guatemala’s National Police. 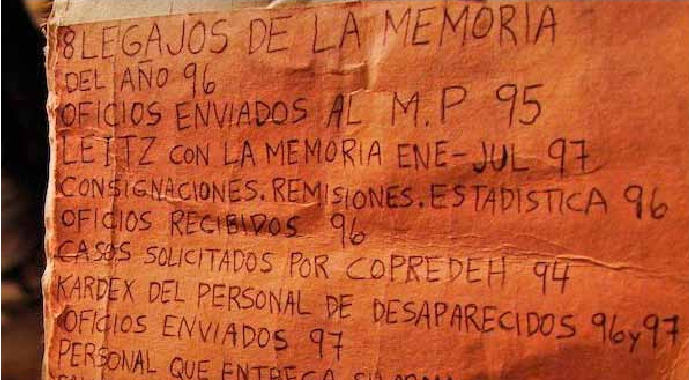 Courtesy of Archivo Histórico de la Policía Nacional, Guatemala. Through these collaborations, librarians need to encourage scholars to think about new kinds of research techniques: accessing large data sets for scholarship, engaging students in these kinds of practices. Texas has implemented research fellowships to students to engage in ongoing work of the archive. The challenge becomes how to build on the relationships built so far. Steven Wheatley, Vice President, American Council of Learned Societies (ACLS), discussed the parallel interests of ACLS in libraries and scholarship and shared his own thoughts on organizing stakeholders to build global libraries for global universities. As neither the federal government, nor any other single institution, will likely come to the rescue of libraries and area studies funding, it falls to the community to maximize the system’s existing resources through networking, combining capacities, synergies, and collaboration among institutions (nationally and internationally). He suggested two potential partners: area studies faculty (especially younger scholars), and learned societies. Wheatley maintained that area studies is still a central element in the “global turn,” as it is the only field that reproduces scholars that are, by definition, routinely engaged with other cultures. area studies scholars are at the forefront of many of their disciplines. ACLS fellowship programs continue to see a high vibrancy of area studies applications, especially for studies outside the European Union and the other classical regions of study. He noted that area scholars do well in successful awards compared to many other fields—roughly one-third of all awards. Wheatley sees a change in perspective and the growth of scholarship in which there is a true collaboration with regional partners (as opposed to a “we study you” approach). Scholars are establishing scholarly networks and a rapport with archives that will carry through their research over time. How can we engage these scholars, to bring their network into library planning? As for scholarly societies, most learned societies have committees or divisions concerned with libraries. Maintaining a cultural record is necessary for claiming cultural imperative. If today’s library is to claim a global mandate, it must expand the conversation to multiple disciplines. Barbara McFadden Allen, Executive Director of the Committee on Institutional Cooperation (CIC), distributed a paper reflecting on the nature of collaboration in other sectors and lessons applicable to the world of higher education. Allen highlighted several effective collaborations in the library sector, including CRL, HathiTrust, and regional collaborations such as the Triangle Research Network and the CIC. that scholars have embraced collaborative research, scholarship, and teaching. inform the ways libraries structure institutional collaboration? Lucinda Covert-Vail, Director of Public Services at New York University Libraries, submitted a paper outlining some of the implications of the global expansion of U.S. higher education for library collection-building. As research universities increasingly engage in global joint ventures and research initiatives across borders, disciplines, and institutions, libraries are being called upon to serve the needs of global curricula as well as faculty and graduate student research, both at home and abroad. Along with the challenges of serving a global campus, libraries may be presented with significant potential benefits. These include: opportunities to identify and collect primary source material from the region where the institution or research is based; collaborations between U.S. libraries and content producers in regions of interest; opportunities to build local expertise for building, describing and even digitizing or preserving collections that can be shared more broadly. Covert-Vail noted that libraries interested in such potential must navigate legal, political, and cultural differences; the challenge of working across time zones; infrastructure discrepancies; and many other pitfalls. She suggests that we are only just beginning to learn from the experiences of globalization and our global campuses, faculty, curriculum, library collections, and corresponding services. Betsy Wilson, Dean of Libraries at the University of Washington (UW), shared her personal reflections on global scholarship and libraries. The University of Washington, which sits on the Pacific Rim, faces an expanding global curriculum in the sciences, technology, engineering, and health sciences. Like other institutions, UW has invested heavily in new units to facilitate global dimensions in all aspect of education, clinical care, and research. The library has expanded along with the university, with “global” as a defining characteristic. The library has many collaborative relationships with scholars, students, the local heritage communities, and overseas institutions. Students act increasingly as “agents of the library” in their travels. Graduates, and increasingly undergraduates, use non-English resources in their research. These research areas—human rights, climate change, worldwide heath threats, international economic issues—require a research enterprise that transcends political, cultural, and geographic boundaries. The ongoing challenge is to balance the need for national collections as well as distinctive local strengths, to provide core material for undergraduate teaching and research, as well as “reasonable access” to less-used research resources. For research libraries to continue to play a critical role in this multi-institutional, multi-lingual, and cross-sectoral environment, Wilson stated the need to move toward a “global information ecosystem,” which entails a mixture of components, including system-wide, scalable solutions, usually associated with the university, and professionalized mechanisms for scholarly communication. She also stressed a more decentralized, entrepreneurial approach to innovation that occurs in informal networks and unaccredited mechanisms. How to represent world knowledge in systems that are based on assumptions of the English-speaking world? How to use advances in artificial intelligence and machine translations to enhance access to the world’s resources in our own languages? How can libraries ensure scholars and students have access to materials in languages they cannot read? How do we avoid privileging the familiar and easily accessible information resources at the expense of more important, but more obscure, foreign language resources? What is the libraries’ role in safeguarding global information commons? Information is becoming increasingly privatized. Libraries should work with academic presses and overseas institutions to distribute local research through alternative publishing models, such as Open Archiving. Scholarship, innovation, and discovery rely on sustained availability and access to knowledge. The creation of public value is central to our mission of our libraries and universities. Selection, sharing, and sustainability are long-standing components of library mission and should remain so as we transition from the print to the digital library world. Long-term curation of content is critical in the digital future ahead. Identifying funding models to carry our “narrative” forward. These themes will be areas of ongoing study as the Advisory Committee creates a “blueprint for a new international collection development system” and an action agenda for research libraries, and vets the issues with a wider audience of stakeholders, including scholars, librarians, learned associations, NGOs, and other associations as appropriate. Universities have made substantial investments in international scholarship, and institutions increasingly aspire to create “global universities.” Interdisciplinary and comparative methods of inquiry are creating a growing demand for global library collections and services. However, as internationalization at many universities is driven to a large extent by the professional schools (Law, Medicine, Finance, Engineering, etc. ), interests and research needs of these actors create new demand for collections funding and resources. New technologies have changed the information environment. Materials of interest to area and international studies today encompass materials that exist in a wider array of formats and media (audio, web content, and electronic news) and are produced in higher volume than they were 20 years ago. allow for decentralized response, half-perfect solutions, and some tolerance for failure.